NetScaler ADC monitors server health and allocates network and application traffic to additional servers for efficient use of resources. It also performs several kinds of caching and compression. It can be used as a proxy server to process Secure Socket Layer (SSL) requests instead of servers (SSL offloading). This blog covers the basic Hyper Text Transfer Protocol (HTTP) site load balancing configuration. A user enters a URL into their browser. The URL's Domain Name Server (DNS) record points to one of the public Virtual Internet Protocols (VIP) on NetScaler and identifies the traffic's protocol (such as HTTP port 80 traffic). NetScaler then passes that traffic to one of the servers in the server pool, based on the balancing method defined (such as round robin, persistence, and so on). 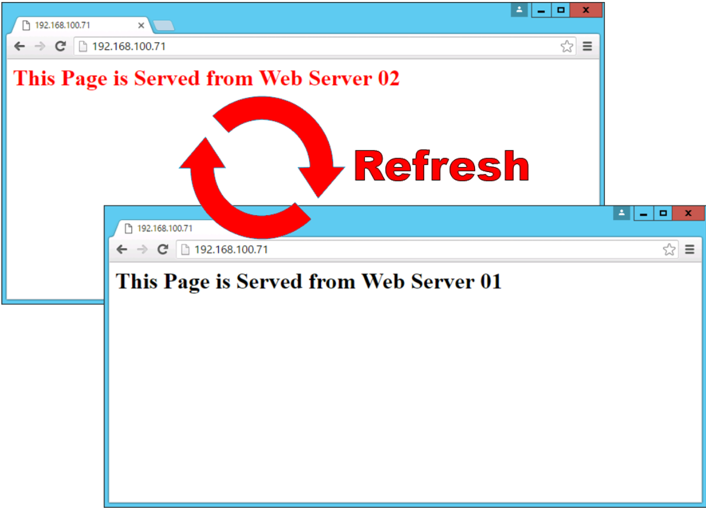 The servers send back the page or application that the user requested by using a Load Balancing Virtual IP (LBVIP). The LBVIP routes the traffic to the Internet by setting the source to LBVIP. The web page or application displays on the user computer. Load the necessary license to NetScaler. 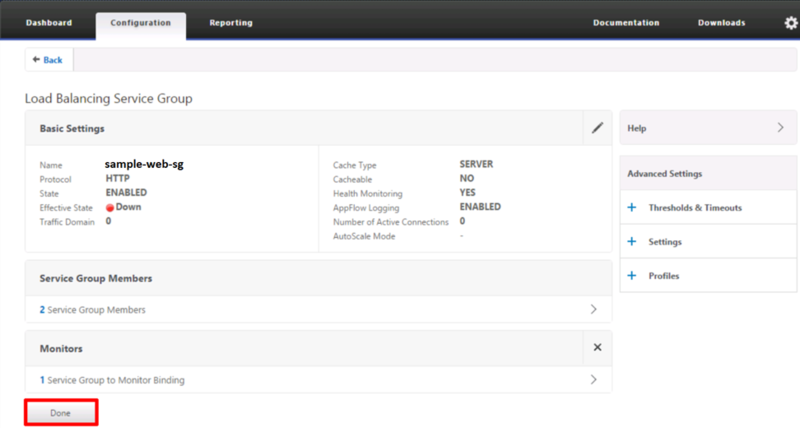 Configure the MGMT port for management access. Configure DNS servers and the Subnet IP Address (SNIP) in the same server subnet and allow the Virtual Local Area Network (LAN) in the switch trunk port that is connected to NetScaler. Connect to the management IP of your NetScaler. Select Login > Configuration > Traffic Management > Load Balancing > Servers. Choose a naming convention for the first server and enter its IP address. This example uses `Web-01`. Repeat steps 3 and 4 for the other backend web servers. 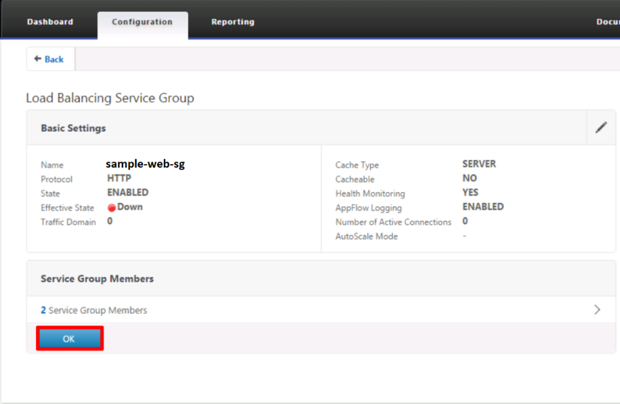 Group these servers together in a service group configuration by choosing Traffic Management > Load Balancing > Service Groups. Name the service group and set the protocol to HTTP. Click No Service Group Member. 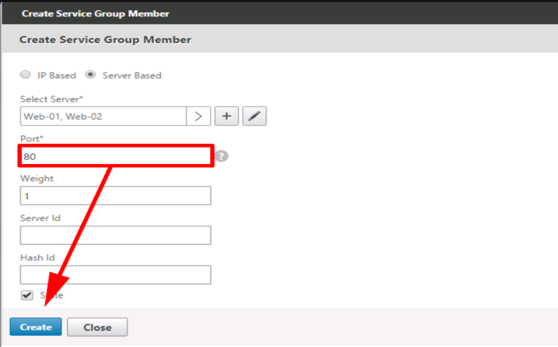 Select all the servers with the search arrow or add servers directly by IP base instead of creating them individually. Set the server listening port (For example, the HTTP protocol is TCP port 80). 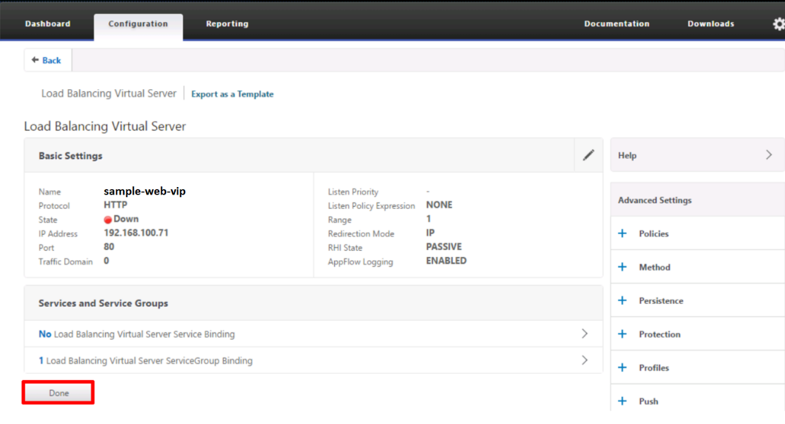 Change the monitoring from SNIP to Backend servers. 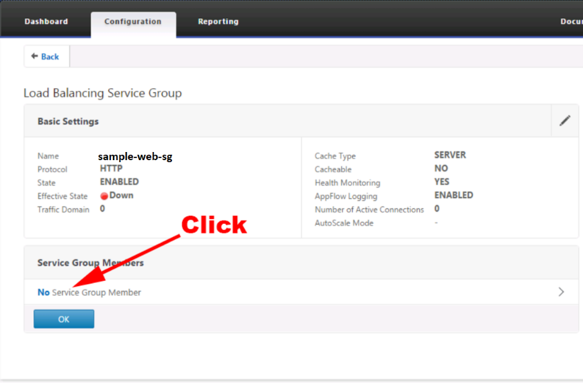 Click No service Group Monitor Binding and select the required monitoring binding. In this case, choose the HTTP NetScaler that has a monitor for HTTP preconfigured. Click the search arrow, select http-ecv > Bind. Create a virtual server by choosing Configuration > Traffic Management > Load Balancing > Virtual Servers. Set the protocol to HTTP. 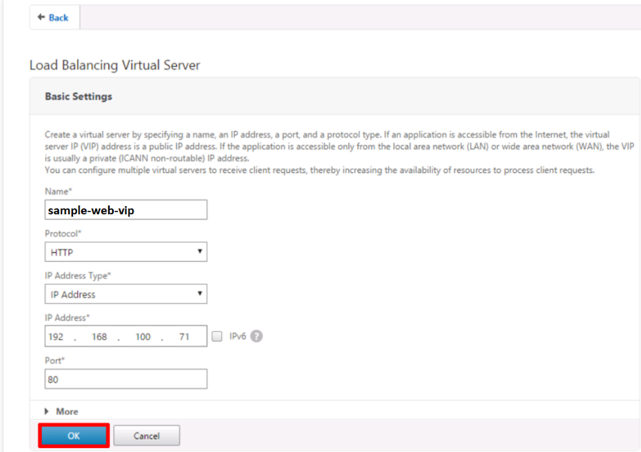 Specify the IP address, which should be the VIP that NetScaler presents to the outside world. Set the port to 80. 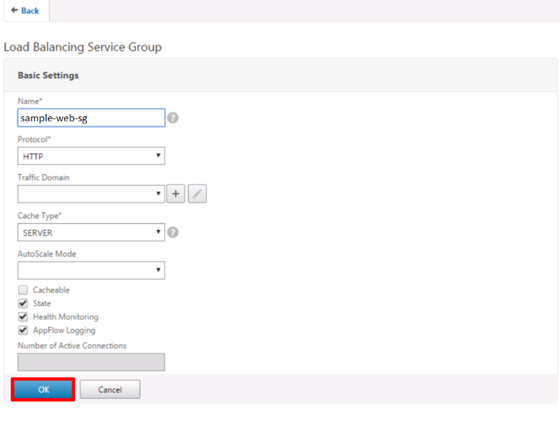 Add the previously created group by clicking No load balancing Virtual Servers Service Group Binding and click Select. Click Bind and click Done. Save your work and wait for the VIP to come up. Use a load balancer to distribute the load across multiple web and application servers. Load balancers can also do SSL offloading to expose the application or URL to the Internet in a secure way by installing an SSL certificate. If you have only one back-end server with SSL offloading, you should install the SSL certificate on the server and expose the server to the Internet with all the appropriate security measures and patches. You should open only the required ports on the firewall for the LBVIPs or the back-end server with SSL offloading when you expose it to the Internet.